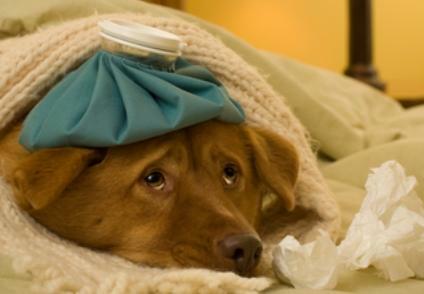 Dogs can catch colds just like people. Help keep your dog healthy by learning how to spot signs of a respiratory infection and how to treat it before the illness has a chance to develop into something serious. While these symptoms can make your dog relatively uncomfortable, they're not severe. Most dogs will get over a simple cold within about a week without any treatment as long as they are kept warm and hydrated. Limit time spent outside during cold weather. Cold air tends to make the bronchial tubes constrict; this makes it more difficult for your dog to breathe. Provide extra nutrition like boiled chicken and brown rice to coax your dog to eat. This will keep his or her strength up and provide immune system support. Run a cool mist vaporizer near your dog's sleeping area to help keep the bronchial tubes moistened. Encourage your dog to drink liquids, even if you have to tempt your pet with low sodium chicken broth. This will help keep nasal secretions thin and less likely to clog your dog's nose. You can administer children's cold medicine to your dog, but only if the type and dosage are approved by your veterinarian. This won't cure your dog's cold, but it may help ease the symptoms and help make your pet more comfortable. The first step in deciding whether your dog needs medical care lies in recognizing his or her symptoms. Once you've determined that your dog may have a cold, you must decide whether or not it's worth a trip to the vet. Although some respiratory infections do get better on their own without medical intervention, it's difficult for a layperson to judge just how severe a dog's illness really is. The general rule of thumb is that puppies and senior dogs should both be examined by a vet any time they have cold-like symptoms. This is because their immune systems are usually weaker than those of healthy adult pets, and a cold is more likely to progress into pneumonia. With that said, many owners prefer to err on the side of caution and take all sick dogs to the vet for a professional opinion. The symptoms become more intense. The dog develops a rattle in its chest. The dog is in obvious discomfort. The dog stops drinking liquid. In many cases, a vet will prescribe an antibiotic to treat the illness. While it's true that antibiotics are not effective against viruses, these medications can destroy invading, opportunistic bacteria that make a dog even sicker while its immune system is fighting off the original virus. Sometimes, what appear to be symptoms of a common cold can actually be attributed to a variety of respiratory infections caused by canine-specific viruses and bacteria. Some of these infections simply have to run their course until your dog is well again. Others can develop into serious illnesses if allowed to progress unchecked. Take a look at some of the most common illnesses that produce symptoms similar to the common cold. The parainfluenza virus is one the most common and most contagious purveyors of cold-type illnesses in dogs. That's why combination vaccines include an inoculation against it. The infection is characterized by a chronic cough. Canine adenovirus type-2 is a major cause of common kennel cough, and it produces symptoms that are often mistaken as signs of a run-of-the-mill dog cold. Although this virus is included in combination vaccines, it's not possible to completely protect a dog from contracting the illness. However, an inoculation will go a long way in lessening the severity of the virus if your pet happens to contract it. Kennel cough, frequently caused by the Bordetella bronchiseptica bacteria, is another illness that presents cold-like symptoms in dogs. Canines with kennel cough are most notably affected with a rasping cough that often brings up phlegm. Secondary symptoms include discharge from the nasal passages and eyes. In many cases, kennel cough will resolve itself on its own as a dog's immune system attacks and overcomes the invading bacteria. However, if the animal's immune system isn't strong enough to overcome the infection, it can progress into pneumonia. Parainfluenza and adenovirus can cause kennel cough. Canine distemper is a systemic and highly contagious disease. It is one of the viruses dogs are routinely vaccinated against. The virus is easily spread via the fine vapor in an infected dog's exhale. Distemper is a serious illness that is often fatal. The virus can remain viable in the environment for up to one year. Once a dog contracts this virus, the organism begins to chip away at white cells leaving that dog open to other opportunistic infections such as the diseases mentioned above. Keep in mind that a cold is seldom as simple as it seems. Take the condition seriously and provide your pet with veterinary care if you believe it's warranted. Doing so can keep your dog's cold symptoms from developing into a life threatening respiratory infection.